On August 16th, Millennial Action Project partnered with The Embassy Row Hotel and the Passport Program for a Summer Send-Off happy hour. 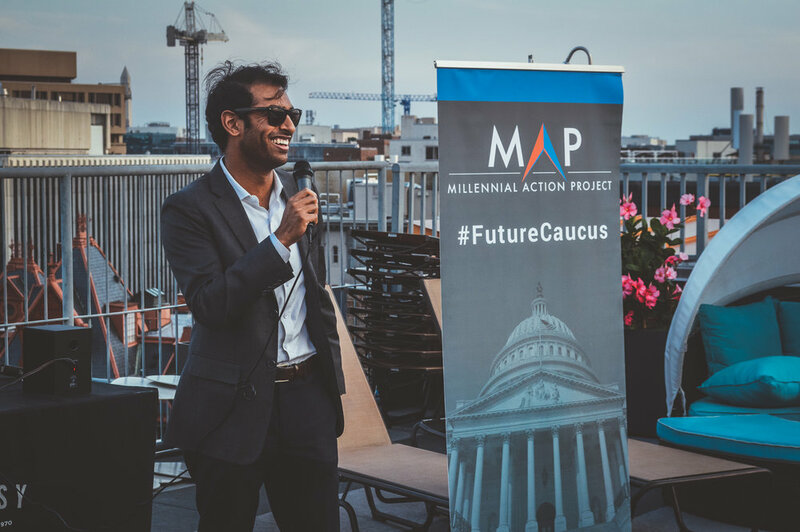 The celebration of MAP’s exciting summer was held on the hotel’s picturesque rooftop bar, complete with beautiful views of downtown D.C and the monuments. More than 50 guests from across D.C. chatted and networked, and enjoyed the view while sipping a “Post-Partisan Rum Punch”, MAP’s signature drink for the occasion. Guests also took advantage of the 60 free D.C. drink passports generously donated by the Passport Program, booklets full of summer drink deals to use all over the city. To cap off the evening, MAP President Steven Olikara gave a toast to a successful summer. Attendees listened attentively as Olikara discussed MAP’s recent achievements, including its Future Summit in Los Angeles and Red and Blue Dialogue series in Wisconsin; a post-partisan future; and how MAP can positively impact politics longterm. Next stop? MAP’s 5th Anniversary Celebration!